Here are instructions for managing the overall site, such as ALM Octane database servers, mail servers, and logs. This context is also for adding spaces and reviewing the history of modifications to spaces. On-premises site admins can manage the site from the Site area in Settings. Site administration includes tasks such as managing ALM Octane database servers, mail servers, and logs. The site context is also for adding spaces and reviewing the history of modifications to spaces. On-premises site admins can manage the site from the Site area in Settings. You can perform the following server management actions in Settings > Site > Servers. Refresh the status of the servers to test connectivity. Click the relevant server, and then click . In the Application Logs area, click the log file name, change the Level and Max Size, and click Save. The log is written to the relevant log file in the specified path, according to the context in which you are working. Example: When you are working in the context of the main ALM Octane application, the log is written to the app.log file located in Path. Determines the severity of the events to include in the log. Valid values are: Fatal, Error, Warn, Info, Debug, Trace. Note: If you change the log level to Debug, make sure to change it back when you are finished debugging. When the log size reaches this maximum size in MB, a new log file opens. Change the database admin password. In the Database Servers area, click the server name, change the Admin password, and click Save. Change the mail server host name and port. In the Mail Servers are, click the server name, change the Host name and Port, and click Save. Site admins can delete, activate, and deactivate users from Settings > Site. They can also assign other users the site admin role. Space admins, and admins for workspaces, can also activate and deactivate users For details, see Activate or deactivate a user. In Settings > Site > Users grid view, select the user who should also be a site admin. Click to display the Roles column. Select Site Admin in the Roles column for that user. The operation of deleting a user may take a few minutes. 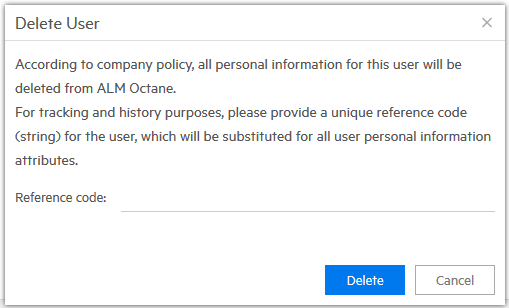 Note: Before deleting in ALM Octane, SaaS operators should delete the user from the system before deleting the user in ALM Octane. In Settings > Site > Users grid view, select a user. In the toolbar, click and answer Yes to confirm. On-premises: If your site is configured to erase all traces of the deleted user, the following appears. Limitation: The ability to erase all traces of deleted users is not supported for SaaS. Assign a deleted user to any new or existing item. Refer to a user in a comment. See the user as part of a team. We strongly recommend that you manage an external file that maps deleted ALM Octane users to reference codes. Enter a reference code for the user from this external file. Internally, references to the user are replaced by this reference code in ALM Octane. If you do not enter a reference code, the user is not deleted. For details on how to configure the site to erase deleted users' details, see FORGET_USER_ON_DELETE under Configuration parameters. Setting the value for this parameter only affects how users are deleted from this point forward, not retroactively. Tip: You can also delete multiple users using the REST API. For details, see Delete multiple users. Site admins can view, add, rename, and upgrade spaces (including monitoring background jobs) from Settings > Site. For details about what the space admin can do to manage spaces, see Manage spaces. In Settings > Site > Spaces, you can see a list of spaces at the site, and select one to see its details. Icons indicate if the space is shared or isolated . While looking at the details, you can also see the history of changes made to the space. To create a shared space, click . To create an isolated space, click . You can rename the space at any time. If the database at your site is managed by database administrators, and ALM Octane is not authorized to create its own schemas or databases, check Use existing schema. Enter the name of the existing space schema to use, and its password. Create workspaces and associate them with the space. For details, see Manage workspaces. Add or remove space admins. In Settings > Site > Spaces, click in the Administrators column's cell of the space you want to edit. From the list, select or remove admins for this space. After upgrading from a previous ALM Octane version, check if any spaces must be upgraded. Upgrade these spaces using the instructions below. In Settings > Site > Spaces, select all spaces and click Upgrade. Upgrade is available only if a space needs to be upgraded. Click Refresh to see the updated status for the spaces. The workspace name is a unique identifier within a space. ALM Octane adds a numeric suffix (_1, _2, and so on) to any upgraded workspaces with the same name. If necessary, ALM Octane truncates the last characters from workspace names longer than 255 characters before adding the suffix. After upgrading, review the names of the workspaces. You can rename them if you want. Note: Until all of the background jobs have completed, some data may be unavailable in trend graphs, and some ALM Octane features might be temporarily unavailable. Background jobs include processes that run after upgrading a space, among other activities. A space is only fully upgraded after all background jobs have completed successfully. Check periodically to see when an upgraded space is ready. In Settings > Site > Spaces, select the space, and click Background Jobs. Review the statuses of the spaces. The space retained its state from before the upgrade. The space is waiting to be sent for upgrade but the upgrade has not yet started. When the upgrade is actually in progress, the current step being processed is displayed. See the status Step # of #. The number of spaces that can be upgraded concurrently is limited. As the upgrade progresses, the current step and operation are displayed. Review the error and the logs. Display the Recovery guidelines field, and follow the instructions. Restart the upgrade. Some jobs can be rerun. If a job failed, try rerunning it. To view sessions, click Site and then click the Sessions tab.